The Joseph M. McDade Recreational Trail is named after a former member of Congress from the area known for his dedication to public lands. 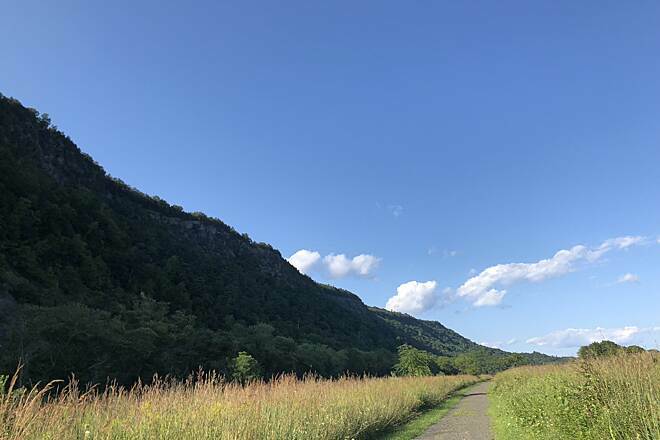 The trail, located within the Delaware Water Gap National Recreation Area, offers diverse views of the river and picturesque streams, open farm fields, forests and historic landmarks. The route is mostly complete with a few short missing sections. When complete, it will extend for 32 miles. Although mostly flat, the terrain varies in difficulty. The first section, along River Road from the Hialeah Trailhead to the Turn Farm Trailhead, is fairly level with a few gentle rises. 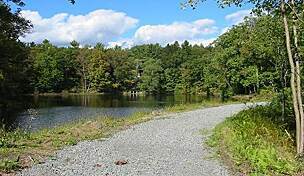 Further north, between Owens Trailhead and Bushkill, the trail is more challenging with a steep hill and a section where you will have to travel on the roadway for a few tenths of a mile. With that exception, you can travel solely on the trail from the Hialeah Trailhead to the White Pines Trailhead, a distance of more than 24 miles. The 10-mile distance between the Eshback Trailhead and the White Pines Trailhead is flat and the best section for cross-country skiers. 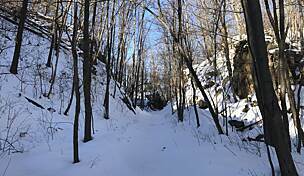 Note that north of the White Pines Trailhead, some sections are designated for hiking only. The most northern segment, between Pittman Orchard and Milford Beach, offers views of rural landscapes and a glimpse of the old Snyder Farm silo. From I-80 westbound, take the first PA exit. Get onto River Road going north and then turn right to reach the Hialeah Trailhead (or continue north to another trailhead; there are many access points for this trail). Avoid Route 209 as it tends to get very congested. Also, note that some trailheads with boat launches have fees, which are indicated on the National Park Service's trail map. I have ridden the trail many times, from Milford and from Dingmans Ferry. I love the surface. Just enough gravel to protect the trail. I love riding through the pine forest areas and over the pine needles. I do wish the trail was rideable just past Raymondskill Road. This is the hiking only section. 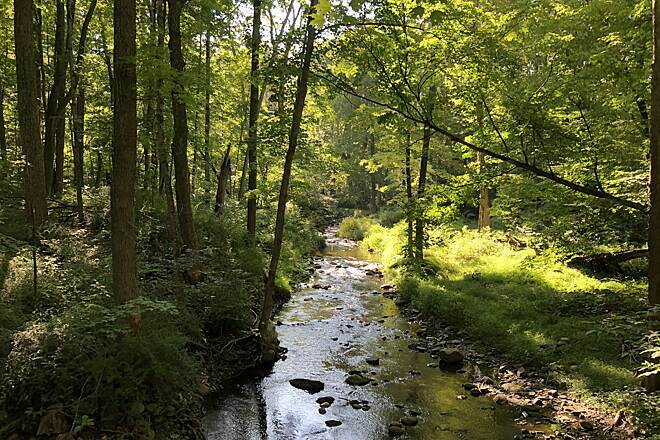 Otherwise, this is a beautiful option for families or groups to get outside and enjoy the river, the corn fields, pine forests and all that this gorgeous trail has to offer. Lucky to live so close. 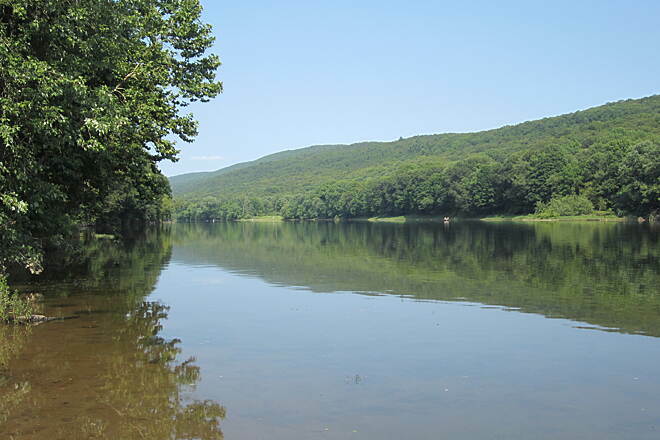 We used to go to Milford, PA, every year to stay at the Hotel Fauchere, eat great food, go hiking on the local trails and canoeing on the Delaware. 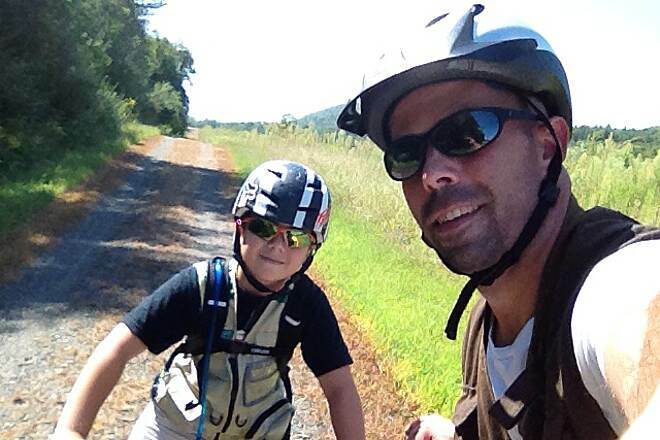 The highlight of our trip was a long, leisurely ride down the McDade trail. We'd go about 4 miles toward Dingman's Ferry, then turn around. We'd take lunch and top by one of the wildflower-covered fields. There were always many other bikers enjoying the trail every time we rode it. But, this weekend, we tried to go on our beloved trail again, but someone - in the last two years - has paved it in large, unpacked gravel. Some of the stones are 1 or even 2 inched in diameter. It made for a bone shaking ride, and we slipped on the stones going up and down hills. This time, we only made it about a mile down the trail before we had to come back, both with headaches and backaches from the rough ride. The trail was in perfect condition before, so I can't understand why some bureaucrat approved this paving without first testing to see if it was a viable solution, and confirming it improved the trails. The trail is now ruined, unusable unless you have a heavy-duty mountain bike (we have nice hybrids). Such a shame that someone's stupidity and ignorance about bike paths has ruined this for the hundreds of people who enjoy the trail through out the year. Now all those people who traveled to the area to use that trail are not going to come. They will take the money they spent shopping, eating and staying in Milford somewhere else. I know we won't be back. 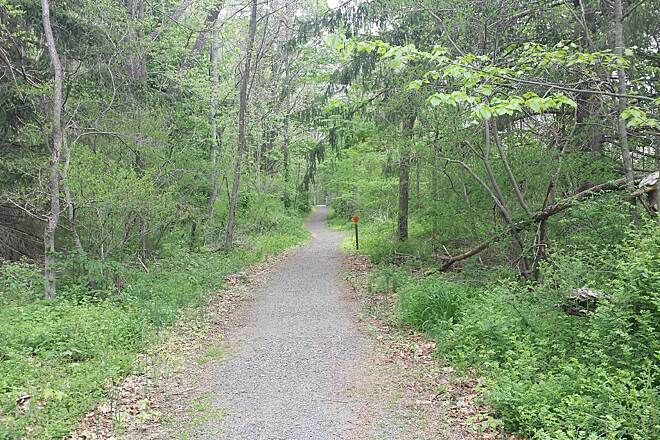 There are many great trails throughout the mid-Atlantic region that are properly cared for and groomed. Shame. Stupid mistake. Would cost a fortune to remove the gravel and replace it with stone dust like every other good trail is paved in. Don't expect to see much of the river. We rode from Bushkill near "Roost's. Went north on the trail. Saw the river for a little stretch. Rode for an hour north and then back Mostly gravel paved. Stopped by boat slip area about 45 min north of start. If you're hoping for some place to stop and buy refreshment or snack along that biking route there's nothing. Be prepared before starting out. Maybe saw 4 bikers the whole time. And handful of walkers. Not busy. Wasn't worth the drive for us. Good workout but as stated..monotonous trail. Some very steep hills but love the twist and turns of the trail. Best part was From Milford for first 3-4 miles-- was totally awesome. Then there's a section of the bike trail that doesnt exist and you have to ride on 209 for 2.5 miles before getting back on the trail, we didnt love that. Overall a great ride. I'd stick with the first section from Milford, or plan on going further to make the 209 section worth it. Great trail, although not to technical with the smooth, mostly crushed stone trail, the trail has some really good hills and turns, beautiful views and lots of neat little bridges. You also get to see many of the abandoned houses and farms in the area that the Feds condemned and bought from the owners at a low price to build the Tocks Island Dam project that never got built along the ride. We enjoy cycling 25-30 miles once a week. We are use to flat trails such as the C&O Towpath in Maryland so when we started on this path we knew it would be a challenge. 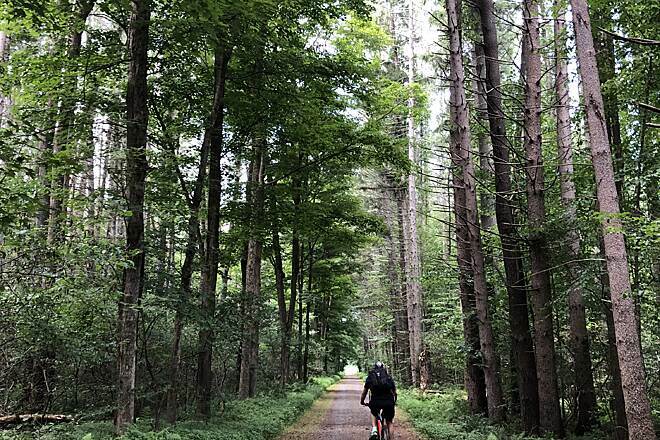 The first day we rode 23 miles roundtrip (RT) from Dingman's Campground to Bush Kill Access and back. It was a very nice ride and the path is well maintained. It is quite hilly in that section but NOT as hilly in the following section. We were exhausted but had our workout and thoroughly enjoyed the ride. Two days later, we picked up our bike ride at Bush Kill Access and went to Hialeah Access and back This was a 20 mile RT ride. This 10 mile section of trail is much more difficult then the one previously. I spent a lot of time walking my bike up the steep hills. HOWEVER, the overall ride was worth it. 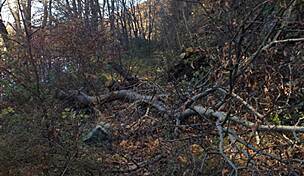 We did discover that you can avoid part of the steep rocky trail on the way back and fly downhill by taking the road out of the Park Headquarters down to the closed off section of the road that parallels the path then reconnects. I believe that is called Community Drive. You have to be careful doing that due to the traffic that speeds by. the good? Easy access from Dingmans Campground and several other points along the route. The not-so-good? Very hilly. Really more a hiking trail than a hiking trail. No views of the river. We rode the trail for several miles south of the campground and a bit north. Both times we rode back at twice the speed on Route 209. I used the McDade trail to return to hiking and regain some level of fitness. I had a goal to hike the entire length (32 miles) which I did in about three weeks April May 2015. The great thing about this trail are the many distance options available. All my trips where YoYos (Hike out and come back to same spot). Many sections of trail can be used by those with mobility issues. The sections north of Dingmans Ferry have some hills. Over all if you cannot find a location you can mannage on this trail it's because your dead. There is camping (by permit), picnic tables and some great beaches at both ends. The trail itself is 90% road (5'-8' wide). There is the occasional "path" but it doesn't last too long. 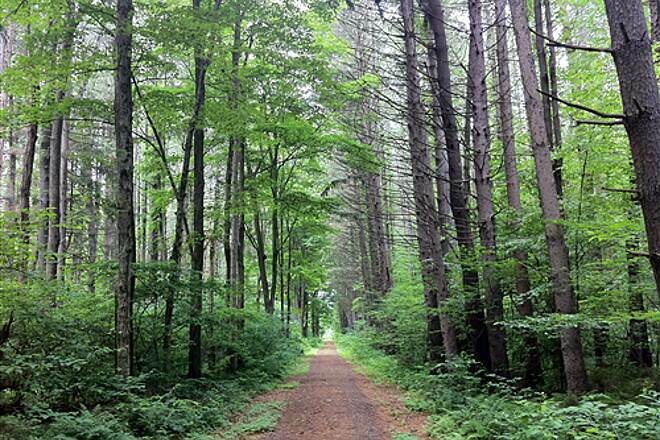 Runners should love this trail. 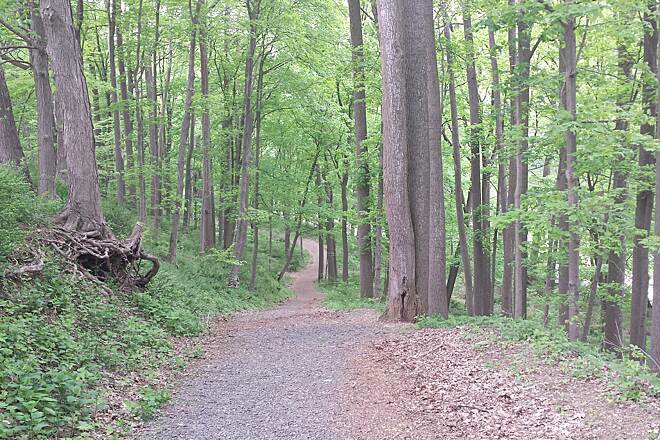 The views of the Delaware River and the manicured pathways of the McDade trail are at times inspiring. I would say overall the trail is mostly easy to somewhat moderate. The sections along open fields, that are south of Dingmans Ferry to Bushkill, would be rough on a hot sunny day. I have taken the trail from milford beach to Dingmans bridge with my mt. bike, a lot of the trail is cinders and wide, but some is not so be warned. At one point you cross a small bridge and suddenly it says no bikes, and for good reason, I had to push my bike up and down steep ridges with sliding shale and the river below, scared me a bit at the time, but it was a good challenge and a test of my might, and I passed. You better be in some good shape if you plan to do that. Other than the physical challenge the views were gorgeous, I sat on the side of the river to eat my lunch, and enjoyed the wildlife. The trail runs through the ravine between 209 and the river, and 209 is waaaayyy above this area so there are no car sounds. My only wish is that my bike was not so heavy, and you should bring a friend because if you get hurt down there no-one is going to be able to get to you and help you out. You will be there a long time. I want to try the Dingmans to 80 part next I hear it is less wild, so Im sure it will be more crowded. Can't wait to check it out. My buddy and myself ride this trail a couple of times a week, from May to October. We get on near Bushkill and head north. We like to do 12-15 miles North and then back, for a total of 24-30 miles. This section is fairly flat with well-maintained roadbed. You will alternate from shady woods-trail to open riding along the edge of cornfields. This is one of our favorite rides. I would avoid going south to the Hialeah trailhead, unless you are in good shape and like climbing gravely hills. If you are coming on 209 from Milford and you park at the first lot do not go to the right. 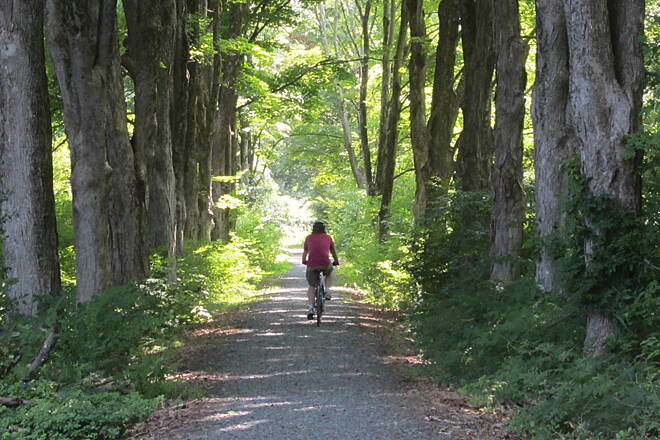 You can bike for a short distance and then the trail is closed to bikes...for good reason! My husband and I tried it anyway and alternately rode, walked and prayed that we wouldn't fall down the ravine into the river. We finally hiked up to the road (which was an almost vertical feat) and were able to take the road back to the bikeable section of trail. On the way back we went past the parking area and little way toward Milford, but due to time we did not go far so I can't say much about that way. The biking parts were nice, I really enjoyed it. When I go again I will park further down past the section that is closed to bikes. This is a great trail. It's not the typical rail trail, in that there are hills and not many road crossings, at least in the southernmost part. This trail is ride-able with either a mountain bike or hybrid; I'd avoid it with a road bike. It's mostly crushed stone, some loose. There is a point, about 6 miles from the Hialeah Trailhead, where the trail hits a carriage road (Freeman Tract Road). The trail sign tells bikes to go right. About an eighth of a mile from there is a parking lot on the left side. Note: The trail picks up in the parking lot. Be sure to enter the parking lot and not stay on the carriage road. If you map the Hialeah Trailhead from NYC or points east on the RTC website, there is a change. 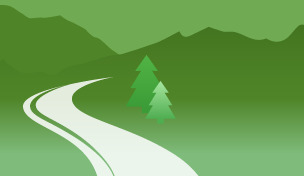 The RTC directions tell you to go on a logging road. This is incorrect. 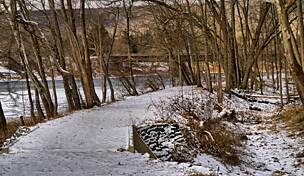 When you get off Exit 310 from I-80 toward Delaware Water Gap, continue straight at the light (past the Welcome Center) onto River Rd. The trailhead is about 3.5 miles on the right. Once you enter the parking area, drive past the day camp sites to the end. This is where the trail starts. We rode on a Friday afternoon and there were few other people there. We basically had the trail to ourselves. The Welcome Center has maps for the trail. The attendant knew the area well. Me and my bro completed 21 of the 32 miles. It was a great experience. The trail was awesome, well designed and built. Going back to do the 32 baby!! Before this I was a Lehigh Gorge fan but going up from the access area above Fernwood the trail is awesome for me with just the right amount of ups and downs. Nice also to know if you break a chain at sunset miles from your car you might hitch a ride on the road. 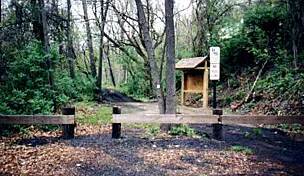 Myself and two others completed 32 miles of this trail starting in Milford and ending at the picnic area. The ride took use 5.5 hours to complete. The trail is maintained but could be marked better. Twice we had to ride a short distance on the road to the next trail head one due to a wash out on the trail, this section i believe turned out to be hiking only and the other because the bridge is not in place near bush kill. In my experience the hills which are encountered tend to be either big and steep or long and drawn out both of which turned out to be pushing our bikes up the hills. This is my home trail and i often find myself completing the section from smith field to the hill right before the park headquarters because of the easy of this section and the awesome views of the mt's and river. Over all you would need to be in decent shape to complete the trail in its entirety and have a lot of water with you if its hot. This trail is hilly, rocky and can be difficult to follow. There are numerous offshoots, including dirt roads and paved roads to traverse while riding between trailheads. Many of the slopes are either unsafe on a downhill, or get-off-your-bike-and-push type climbs. There are typically dog walkers and families creating a kind of crowd in the summer due to the resorts close by. In the winter, watch out for hunters. Check the season before you come to this trail and wear hunter's orange cap or jacket. If you are unsure, wear the orange to be safe and if you have a large dog, it may be a good idea to get a dog vest. I do have to say that the river views are beautiful and horses are verboten from this area, meaning smooth sailing when you are not climbing or descending hills. 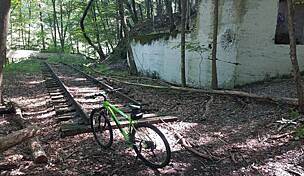 My husband and I were very disappointed to find out that this is not a true rail-trail bike trail. As bikers who each pull 20-lb beagles, this was impossible. On the first day we started at the southern end and had to quit when we reached a steep downgrade. The next day we went to another access point (past the beach pay parking area). From there we went south biking a bit further than the previous day. Again we had to end our trek when the trail got too hilly. I guess I did not read the previous reviews very carefully but for you other "flat landers" this is not our type of trail. Even without the beagles we would not have enjoyed this trail. The trail is well maintained. Good gravel surface and weeds mowed along the side of the trail. Don't know if this trail run continuously for 32 miles. According to the map, the trail ended about 1.5 miles from where we parked on the second day. Best overall bike ride in Eastern Pa.
Unbelievable trail. Nothing treacherous about it, but you must bring your lungs. If you are willing to climb the steep hills, then the downhill rewards are well worth it. Great tire grip, so if you have the will, there is a way. 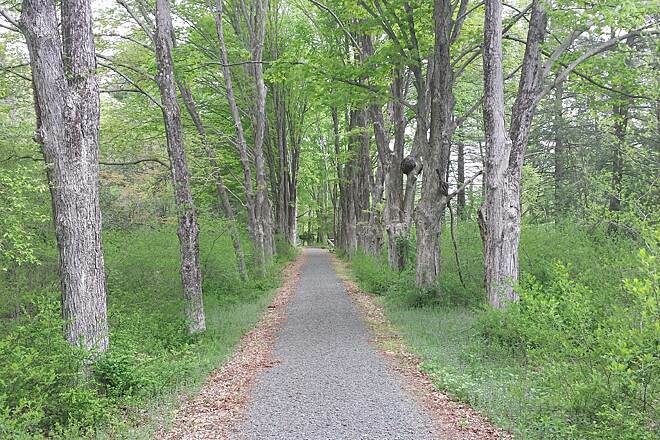 A combination of shaded old grove big tree forests and open meadow riding all running parallel to the Delaware river. Simply beautiful. If motivated can do out and back in one day, but a weekend excursion out and back would be a great time as well. Once again no singletrack, so no danger. Enjoy!!! On Fridy July 13th my wife and I drove up from Promised Land Pa. where we were camping, to Milford Pa. We always investigate and choose a Rails-to-Trails ride in the area we find ourselves. 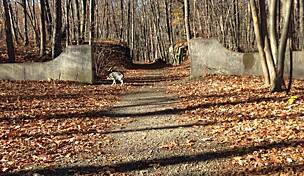 We traveled up to the trails head in Milford where we had a difficult time finding the trail. It's located in a Pennsylvania Recreational facility that charges for admission. There are absolutly no signs or indicators of any kind to (1) show the biker where the Trail-Head is located, (2) if the trail exists at all. We found it at the back of the boat ramp after the life-quard at the beach was nice enough to direct us up there. The start of the ride takes the biker under the Route 6 bridge that spans Pa. to NY. Almost immediately the biker is faced with an uphill trail on cinders that we were forced to walk. One hundred yards further into the ride we encountered a second hill exactly the same. That was enough for the two of us. I don't care if it flattens out for the next 100 miles we still had to ride down those hills on cinders which was impossible. We felt like we wasted our day, time, and money going there. We would never reccomend this trail to anyone especially starting in the Milford area. We rode this trail on 2 warm November days. Starting in Dingmonds Ferry at the corner of State route 739 and State rt. 209, the trail goes up a long grade but is very do able. There are many places to park all along rt 209. (The trail north from here is closed at this time going to Milford due to the floods over the fall. Hopefully it can get repaired soon). From there we traveled south for about 8 miles the first day and enjoyed the scenery and the ride. 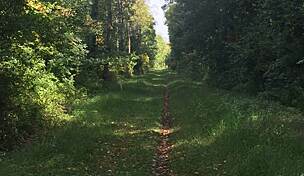 The trail goes through fields and forest that are beautiful and quiet. Most of the ride is on flat gravel terrain that has slight inclines for the first 16 miles. Our bikes are hybrids that handle the terrain just fine. There are many places to stop for a picnic lunch that you bring on your own. Only place to buy some snacks is at the Dingmonds Ferry campground that was not open in November. We rode down to Bushkill Falls and stayed on the trail for about 2 more miles. At this point in Bushkill falls the trails gets more challenging with steep hills and a little rougher terrain. Some of the hills we walked up the hills but the ride down is always fun. 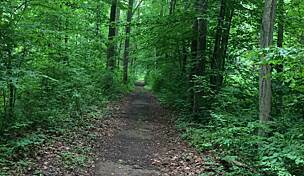 This is a beautiful trail that brings nature closer to you. 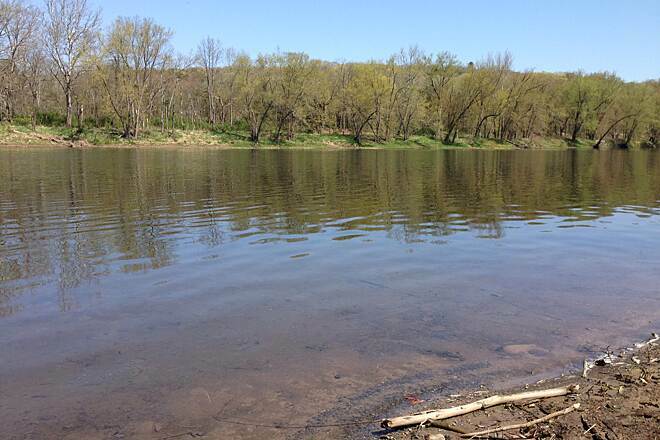 The Delaware River is in view most of the ride and the sound of the flowing water is tranquil and soothing during your breaks from the ride. Many hikers along the route this time of the year and not many bikers which make the ride very enjoyable. This trail has become one of our favorites and we will be hitting this trail many more times this spring and summer. I tripped on this trail while poking around Google Maps, and its a great find! I took the trail from its southernmost point at Hialeah Landing up to the Bushkill Landing on one Saturday, then from Bushkill to the road to Dingman's Bridge. 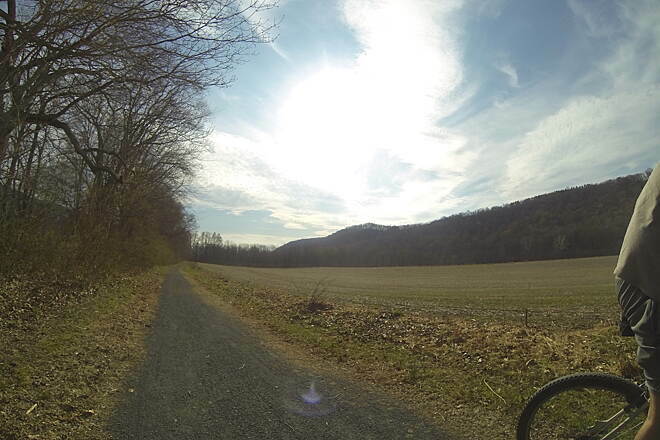 There are a few hills at the start of the tail, then a big one between Owen's Landing and Bushkill, then its mostly flat or minor hills to the end of the biking section. Note: at Owen's Landing you hit a fork where hikers go straight and you must go right (on a road). A hundred feet up the road is a marked parking lot that you MUST enter to get on the trail again (ask me how I know this - 5 miles north to a dead end). At the top of the hill, you must get on the road for a few tens of a mile to get back on the trail. 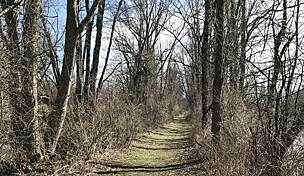 This trail has varied terrain; some in deep forests, some skirting fields, some skirting the river. The hills give you a better workout than a pure rail trail does (some of the trail follows an old wagon road from many years ago). 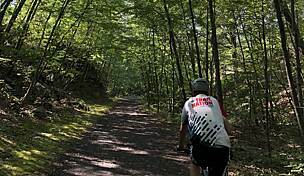 Bikers can go about 24 miles before the trail turns into a hiker-only section, and hikers can go over 30 miles. 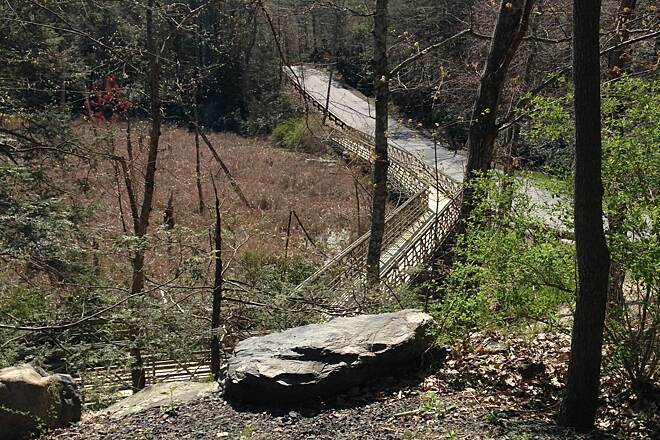 I made the excursion to Dingman's Bridge so I could cross over to NJ - it's half a mile on a road with no shoulder to speak of - but not much traffic either. The trail has a consistent crushed gravel surface - the first Saturday I was on road tires (1.65x26) and had no trouble. Several rest areas and one general store provide creature comforts.